This delicious Instant Pot Bean with Bacon Soup needs no pre-soaking of the beans and is ready in just about an hour! Bean with Bacon Soup is one of my favourites. I grew up with the Campbell’s™ canned stuff and while I’ve moved beyond the can, the flavours are still a favourite. I have a stove-top Bean with Bacon Soup on my site already, but I just had to re-create it for the Instant Pot, too. 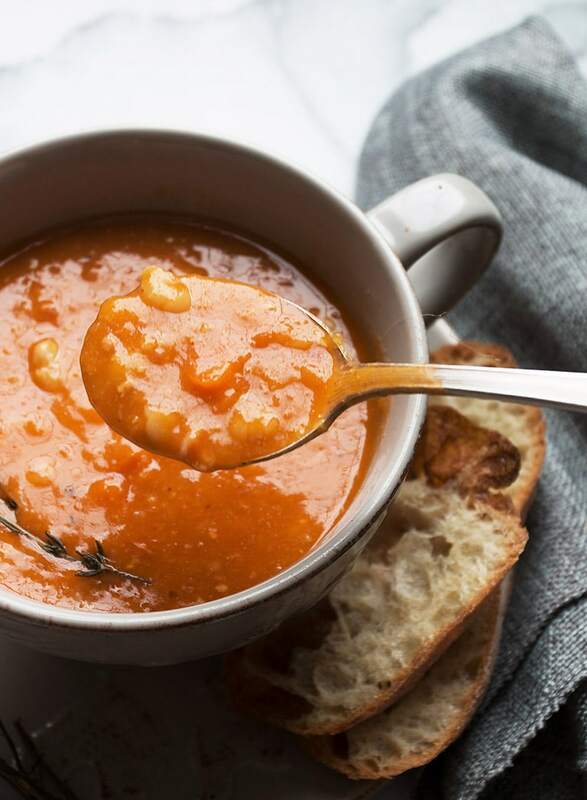 I experimented with a few different ways to adapt this soup for the Instant Pot and found that doing a quick pre-cooking of just the beans produced the best results. 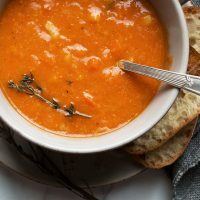 It only adds a little time to over-all soup and made a big difference in the texture of the soup. Beyond that, it’s just a quick saute of the bacon and vegetables, then everything goes into the pot to cook. At then end, add the flavourings and thickener and it’s ready to go! Be sure to dice your carrots fairly small. You don’t want big chunks of carrot in this one. I like to use my immersion blender to break down some, but not all, of the beans. It thickens the soup nicely, but still leaves plenty of whole beans in the soup. I love adding liquid smoke to this soup. The flavour is great. You can find liquid smoke in the same part of the store where you would find Worcestershire sauce etc. Don’t forget to salt your soup! Salt is critical for bringing out the great flavours. Make it Vegetarian! Simply omit the bacon (or use a vegetarian “bacon”) and use vegetable broth instead of chicken broth. Liquid Smoke is vegetarian, by the way. I found the flavour of this soup was even better when it was made ahead and refrigerated. The extra time really gives the flavours a chance to develop. So don’t hesitate to make it ahead and re-heat later. If you have a 3 quart Mini Instant Pot, be sure to half the recipe below so there isn’t too much for the smaller pot. Simply change the Serving below in the recipe card from 6 to 3 and it will calculate the half recipe for you! 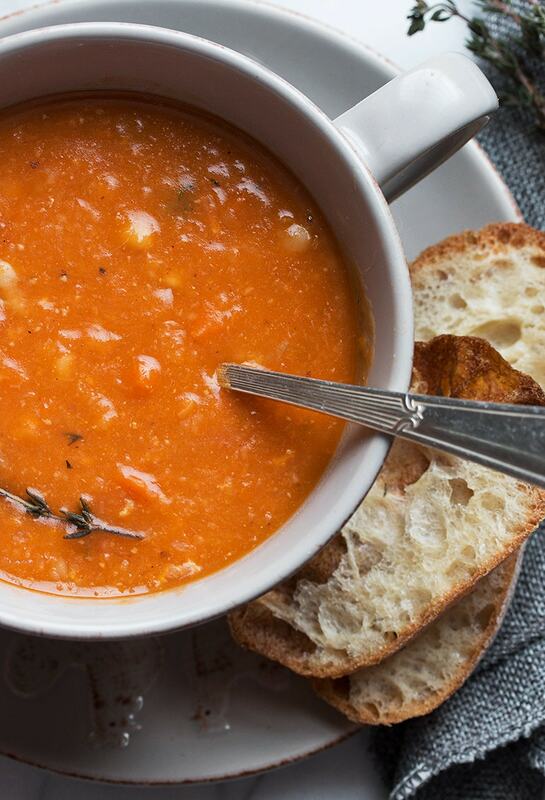 Easy and delicious, this soup is hearty and full of flavour. No pre-soaking of beans required and ready in just about an hour! To pre-cook beans: Add beans to Instant Pot and enough water to just cover, about 4 cups. Set Instant Pot to HIGH Pressure Cook for 10 minutes, with vent in the sealing position. Allow for a 10 minute Natural Pressure Release, then release the remaining pressure manually. Drain the beans and set aside. Rinse out Instant Pot liner and return to Instant Pot. For the soup: Set Instant Pot to SAUTE at normal heat setting. Add bacon and cook, stirring, until bacon starts to brown. Add onion and carrot and cook, stirring, until onion softens. Add bay leaf, chicken broth and reserved pre-cooked beans to the pot. Stir to combine. Cancel Saute and place lid on Instant Pot with vent in sealing position. Set the Instant Pot to HIGH Pressure Cook and set the time for 25 minutes. After cooking, allow for a 10 minute Natural Pressure Release, then release any remaining pressure naturally and remove lid. To finish soup: REMOVE BAY LEAF from soup and discard. Set Instant Pot to SAUTE at low heat setting. Add the tomato paste and liquid smoke, if using. Using an immersion blender, a potato masher or by removing about 1/3 of the soup to a blender, blend the soup slightly, so that some of the beans are broken down, but some remain whole. Add cornstarch/water mixture to soup and cook, stirring, until soup thickens. Taste and add salt and pepper as needed. 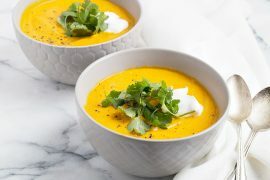 This soup is even better after it has been refrigerated for a few hours, so don't hesitate to make this one ahead and re-heat. The stove-top version of my Bean with Bacon Soup, if you don't have an Instant Pot. I doubled the recipe and used a bean soup mix instead of the navy beans alone. I also added more carrots and onion (both finely chopped in a food processor) because I was trying to use them up! I didn’t have any liquid smoke so I added a splash of soy sauce to each bowl if the person wanted. I loved the flavour of this nice thick soup! It was also a hit with my husband and young son. Thanks for the tip on pre-cooking the beans! So glad you enjoyed it! I grew up with the canned stuff too, so that was what I was aiming for :) Thanks! 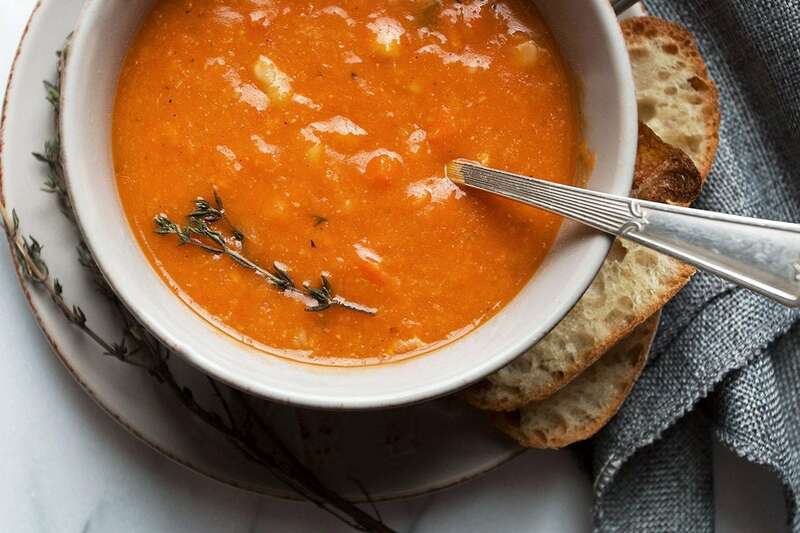 This soup hits all the right notes with me. I also love how puréeing some of the beans thickens the soup and makes it richer. 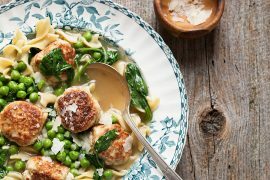 I keep telling myself that I have no room for an Instant Pot in my kitchen but when I see recipes like this one I second-guess my decision. Your soup looks wonderful! What a lovely warm recipe. I’m heading for my pantry and the dried beans now! Keep these InstantPot recipes coming…we “potheads” are eager for interesting and innovative ways to use our new darling appliance! Those of you who still have them in your garage in boxes…GET THEM OUT…you won’t be sorry! I note that you are far-afield in your research ~ items from a Russian site? !…my goodness. Thanks for doing such research for us and finding possible gems. You are so appreciated! Thanks Vivian and I will keep them coming! Learning lots on how to best use it (like this soup!). 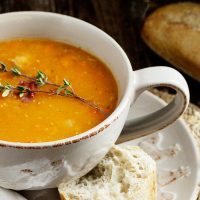 I am a fan of bean soup and pre-cooking the beans in an instant pot sounds like the perfect approach. Must have bacon or smoked fatty pork for sure! Thumbs up. The liquid smoke sounds very intriguing. You have got me thinking about experimenting with smoked beer in its stead, lol. Maybe sub out a cup of the stock with it. Very curious:) Pinned so I remember to try this recipe. This looks wonderful! And even more wonderful now that you have adapted it to the IP! It’s a must-make! We also used to eat this flavor of canned soup years ago too. I’ve been down all week with the flu and had to resort to eating canned soup. Boy was it awful. I’m spoiled by homemade food most days and cannot believe how bad it really tastes to me now. It’s been years. Anyway – I have a new Instant Pot sitting in my garage that I’ve never used! I have to get with the rest of the world and give it a go. 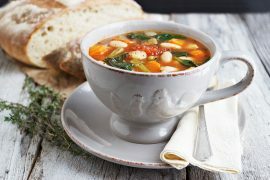 Love this soup and the way you thickened it with part of the beans. Bacon is always a great idea too and this looks delicious. Have a great weekend! Thanks Tricia, but sorry to hear you’ve been sick. Feel better soon! I still haven’t grabbed myself an Instant Pot Jennifer. Bean soup is one of my favorites. Reminds me of growing up. My mother used to make it quite often during the winter months. I love how this is done in just over 30 minutes!